Wild food is anything edible that has had no management to increase its production. This subject really also encompasses coastal foraging, wild mushrooms, crayfish and game, but we’ve listed these as separate topics; we focus mainly on wild land plants (leaves, berries, fruits, nuts, roots or sap) in this topic. Wild food was once necessary for human survival, but now most traditional knowledge of wild food has been lost. In recent years there has been a widespread revival in foraging, and you can now do courses all over the UK from the wilds of Scotland to urban centres like London. Fat Hen, nutritious and commonly found in gardens as a ‘weed’. Many of the plant species that we view as weeds are edible and nutritious – modern farming favours foods that have been cultivated from their wild ancestors. We clear away ‘weeds’ to grow crops, yet many wild plants are more nutritious than their cultivated counterparts. For example the edible wild plant ‘fat hen’ contains more iron and protein than spinach, and more vitamin B and calcium than cabbage. As with many other wild foods it can also be cooked in the same way as the vegetables we regularly eat. Wild food plants and fungi form a part of the rich diversity of species that is vital to the functioning of ecosystems. Many of these species are being lost due to habitat destruction and pollution. Collecting wild food is much more popular in continental Europe. In one region of Finland 68% of households pick wild fungi for consumption – unimaginable here in Britain. Blackberries and other wild fruits can be eaten fresh, or made into jams, wines, cordials, crumbles or pies. What are the benefits of wild food? As long as we are sensitive when collecting wild food and consider other species, harvesting wild food can be beneficial to the environment. Wild food has no packaging, no chemicals to force it to grow, and can be picked local to your area, minimising food miles and pollution from vehicle exhausts. Picking wild food in moderation can foster appreciation of nature, resulting in greater conservation of species. For example, if we wish to harvest wild garlic every spring, we might be more active when it is under threat! Eating a range of different species maintains biodiversity – the opposite of our intensive farming system, where we grow crops in monocultures, with damaging effects for the environment. Target species are favoured over wild species, and are grown intensively using pesticides, which can have detrimental effects on wildlife. Many of the wild animals that can be eaten are pests that have to be controlled and are often wasted. Nettle omlette: many wild foods can be cooked in the same way as the cultivated vegetables that we are used to eating. There are recipes for wild foods in the books in the ‘resources’ section. One example is the grey squirrel, a tasty introduced species that causes damage to tree saplings in woodlands, and outcompetes our native red squirrel. If they are to be culled, isn’t it better to eat them in preference to animals that may have been fed intensively-grown crops, housed indoors, pumped with antibiotics and transported many miles to reach your plate? Consuming wild food can instill a greater respect for the environment, reconnecting us to the origins of our food, and illustrating our dependency on nature for survival. It also highlights the importance of seasonality and offers an alternative to our current globalised food system, where we can buy anything at anytime of the year. There are health benefits too, as seasonal food matches the body’s needs. For example the spicy peppery leafy greens that arise in spring are good for renewal after the winter, and clean out the digestive tract. Our prehistoric ancestors browsed on wild foods from their local area, gaining the nutrients needed for healthy immune systems. Collecting wild foods is also thought to have a therapeutic value and is a great incentive to enjoy the countryside. Collecting, processing and eating food from your landscape, in the season it grows in can support a real felt sense of connection to the land and time of year. Wild garlic (or ramsons) is thought to be healthier than cultivated garlic due to it’s green pigment chlorophyll. It grows in abundance in spring, giving off a strong smell. It is delicious in salads or used as a flavouring in cooking. Foraging for wild food is exciting, as you never know what you are going to find. Wild plants and fungi grow in many places, even on wasteland in towns. Wild food is not only free but has also grown without us having to do any work. Learning from someone who knows about wild food is a great start – a mentor or course teacher. Being shown the plants in their natural habitat is really helpful when wanting to find and identify them later. A good foraging basket is very useful to carry with you in the autumn, you never know what you might come across on a walk. Getting a good book or two will really help – especially if you can take them with you as you go out. It can be a good idea to have a field guide and a wild food book – as field guides are often much more accurate for identification – but don’t necessarily tell you whether you can eat it. Anyone can pick their own wild plants and fungi; however there are some simple principles, and laws, that must be followed, for your own safety, and the preservation of plant populations. Be 100% sure of your plant identification… ‘if in doubt, leave it out’. We have some seriously poisonous plants in the UK, so get to know them, as well as getting to know the edible ones. Double check the location you are foraging – avoid pesticides or other toxic substances, and foraging beside busy roads. If you are foraging water plants, always cook them – the risk of Liver Fluke and other water borne illnesses is high in the UK. Leave plenty behind. Different people have different proportions they like to leave. Always leave some for wildlife and other foragers. Make sure you have permission from the landowner if necessary. It is illegal to dig up a plant without permission. Species must not be picked from a National Nature Reserve (NNR) or Site of Special Scientific Interest (SSSI) without permission. Gather plants from healthy, plentiful populations. Be aware of where you are treading, be careful of damaging other plants as you reach for the juiciest blackberries! And damage the plant you are picking from as little as possible. Giant puffballs: one can go a long way; they are delicious, have a wonderful texture and can be cooked like any other mushroom. If you’re a beginner, try picking obvious species that you are already familiar with – for example nettles or dandelions. Just as importantly, familiarise yourself with the poisonous plants in your area too. Never eat any species that you are unsure of. Remember that many species are poisonous and some must be cooked to remove toxins. Marlow of Wild Food UK shares spring green foraging tips – edible and poisonous plants. Thanks to Ruth Hepworth for information. Ffyona Campbell was taught by Aborigines, Bushmen, Pygmies and a great outdoorsman and has applied herself daily for the last 15 years to the task of learning the wild foods of Britain. Ffyona runs Wild Food Walks, based in Devon. She is the author of 5 books including The Hunter-Gatherer Way, and those documenting her journey as she walked around the world. Thanks for the interesting article. 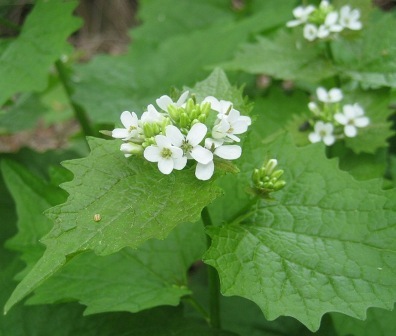 Have you ever tried “Jack-in-the -hedge” or Garlic mustard Alliaria petiolata, it is a very common hedgerow plant and is coming through now, as kidney shaped leaves which as the plant ages turn into a more nettle like form. It has a very subtle garlic / mustard and cress taste, and is great for salads and sandwiches. and there’s loads of it about in May – had it in salads a lot at Redfield.